As I worked my way to healthy muscles, I wound up combining Robert Masters’ Psychophysical Method, Feldenkrais and yoga to release the stubborn patterns in my body. Soon I began introducing it into my yoga classes and then teaching classes just based on the sets I’d created. These gentle movements create amazing impacts and I’ve loved watching the wonder o peoples’ faces when they move around and realize how much has changed. I’m plotting and planning the launch of a new blog/site with weekly videos, info on other healthy practices and a book with pictures, DVDs and downloads available. When the joints are open and aligned and the muscles are flexible, your body flows. When your body flows, your life flows. The new site will be Flowing Body, Flowing Life. When I began taking yoga in the mid 1980’s, I knew that I was really tight, but didn’t realize for several years that every muscle in my body was twisted into knots, all the muscles in every group glued together and every muscle group glued to my bones. Gaining freedom from that state of affairs has taken many years. Yoga has always been my stalwart friend but faithful practice of yoga alone has never been enough to resolve my problems. A lot of great body workers have helped (none more than Kreig Cremeans here in Lexington who created Bodypatterning and has been unlocking the final hold-outs with the assistance of my regular practice of these triggers of release). I was introduced to the work of Moshe Feldenkrais in 1990 and then given a set of tapes of his student, Robert Masters, in 1993 around the same time I took a couple of Somatics courses (created by another Feldenekrais student, Thomas Hannah). I loved having the Masters tapes to be able to refresh my memory and I used them many times but I always found that the 45 minutes per body part (45 for ankles, 45 for knees, etc.) he requires made it prohibitive to keep practicing regularly as I needed to work on most of my body daily. I used this work off and on for many years, mostly to get out of crisis moments. Eventually when I came back to it at one point I realized that I had done these movements enough to have memorized most of it. I began putting together routines in which I worked on several areas for 10-15 minutes each and then practiced deep stretches in yoga and found that I was creating big changes in my body. When I started going to Kreig every other week I really wanted (in between appointments) to preserve every bit of opening he created so I started practicing these routines every day. Soon I was actually arriving at some appointments more open than I’d been when I left the time before and occasionally experiencing really big releases in those two week spaces between massages. 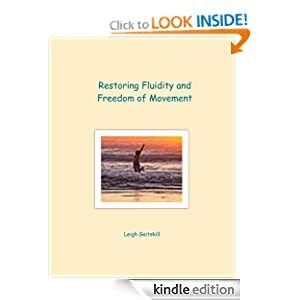 Thus Restoring Fluidity and Freedom of Movement was born. I started introducing these routines to my students because many of them were so stiff that they couldn’t get far enough into yoga postures to actually get much benefit from them. They’ve made amazing strides in surprisingly short amounts of time and I’m now offering classes that use this work so that it’s no longer limited to private clients only. People usually start being wowed on the first day and I love, love, love watching people’s faces light up with amazement at the difference they can feel. I don’t think I’ve found the cure for all ills but I have put together something that can make you feel better and I’d love to help you get there! The basic idea is that your unconscious (or “reptilian”) brain holds onto certain patterns of movement and you can build new neurological patterns by very consciously performing movements that trigger releases and making sure that your mind is aware of the new, more open, possibility. The movements are easy and can be as big or small as you are able. In many cases either one movement by itself is unusual enough for your mind to let go of the normal pattern or various parts of the body moving in unusual patterns — like your head turning one way while your knees go another — confuse the mind so that it lets go of the normal pattern. The more you practice and pay attention to the feelings before and after, the more firmly you will build a new neurological pattern that reflects the increased freedom of movement. The movements are small and easy to do. Almost all are done either sitting in a chair or lying on the floor and I’m working on a selection to do on a bed–for those who have trouble getting up and down from the floor..
A text-only instruction manual that I created for my CE students is now available on Kindle. Leigh, the link to your website is not working. I wanted to see what classes you have available here in Lexington. You can email me if you prefer (I took your triggers of release class once a few years ago.. ) think I need to get back into that, and maybe yoga too.. Thanks for the heads up but actually the website no longer exists and I’m not teaching classes. I am starting to take some private students if they have a place with room enough. I’ll take off the link. I’ll check to see if I still have the e-mail address. It’s $45 and I generally do this movement work in 90 minute sessions — too hard to get everything in in 60. As far as space, it just needs to be big enough that two of us could do postures and movements without slugging each other or bashing into walls and/or furniture. I can do afternoons or evening hours til 9 (finish). BTW: I think I forgot to say it the first time but I do remember you taking class and I thought I recognized your “handle” when you subscribed to the blog. Nice to hear from you. Hi Leigh. So happy to have found your blog, especially this page. I have been practicing yoga daily since February. I had a major spiritual embodiment that lasted three weeks during which I realized I needed yoga to help align my body, mind and spirit. Prior to February I had only practiced yoga on occasion, mostly Hatha. There was an inner knowing that the body’s alignment was the key to releasing trauma, past life patterns, emotional baggage – you name it. I knew the more I practiced the more I would change and thus far it has been very true. 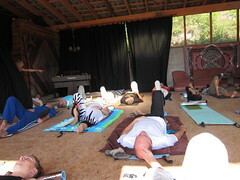 Your words mirror what I realized – “When the joints are open and aligned and the muscles are flexible, your body flows. When your body flows, your life flows.” So thank you!